During Prime Minister Kevin Rudd’s recent whirlwind election stop in the Top End he highlighted the average age of death of the Northern Territory’s Aboriginal peoples – 52 years. This is the nation’s worst. But despite the Prime Minister’s claims that life must be tough in the Northern Territory and his suggestion that Territorians should be granted various further tax exemptions on the premise that the Territory is somewhat akin to living in the remote, devoid of comparative infrastructure as seen in for instance NSW, WA, his base assumptions when checked against data from Government departments, including the Australian Bureau of Statistics (ABS), evidences otherwise. The evidence points to a flourishing Northern Territory, with the strongest per capita economic growth in the country – but not for its Aboriginal peoples. “It costs more to be up here because it’s so far away.” He said that people living in the Northern Territory have harder lives than the rest of Australia. But the Northern Territory is the nation’s fastest growing economy and at the highest rate of growth, followed by Western Australia and the ACT. Ironically, it is in the two biggest Australian growth economies that Aboriginal peoples endure the highest homelessness rates in the nation, the most widespread abject poverty in the nation, the highest imprisonment rates in the nation, imprisonment rates which compete with the world’s highest such rates, the highest youth suicide rates, the highest infant mortality rates, and where Aboriginal peoples on average die younger than anywhere else in the nation. According to the ABS, in the Northern Territory the average age of death of Aboriginal peoples is 52 years old. The death rate has not improved under the “Intervention”. Aboriginal peoples number 80,000 out of the Territory’s 250,000 total population. They make up 83 per cent of the Territory’s prison population, this is the highest such figure in the world. Last year a Northern Territory parliamentary report found youth suicides rising, boys and girls with the average age of youth suicides younger each year. According to the ABS, the infant mortality rate among the Territory’s Aboriginal peoples is 13 deaths per 1000 live births while for non-Aboriginal Territorians it is 4 per 1,000. But ABS data describes the Territory’s per capita economic growth the best in the nation. Others are benefiting, not the Territory’s Aboriginal peoples. It’s the same story for many Aboriginal peoples in Western Australia. In the mining boom Pilbara there are towns arising for the mining boom, with the full suite of infrastructure and services, but not for Aboriginal peoples. 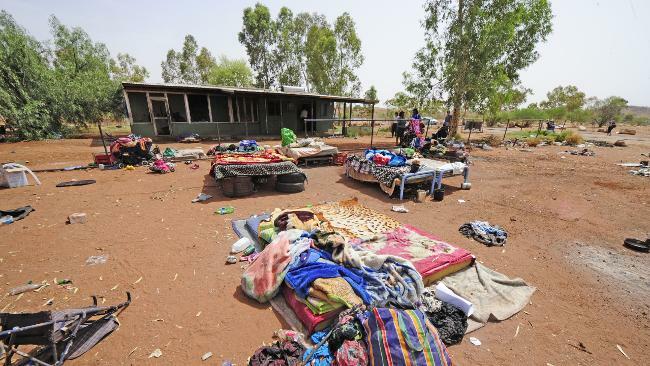 In the Kimberley, 7 per cent of the region’s total population of 42,000 is homeless, but 90 per cent of that 7 per cent are Aboriginal peoples. In WA’s Western Desert and Goldfields regions Aboriginal poverty is in perpetual crisis but miners are getting wealthier, and reporting record profits, and flourishing mining towns stand alongside impoverished Aboriginal communities. In both the Territory and WA each have only 80,000 Aboriginal peoples but Governments, State and Federal, continue to neglect their right to a better life. Prime Minister Rudd is correct about life being hard in the Northern Territory but he needed to explain that this is the case not only for its Aboriginal peoples. The Territory’s economy is growing at twice the rate of Victoria and NSW. Its per resident economic growth rate is the nation’s highest but that the beneficiaries of this are the two-thirds of the population who are not Aboriginal. According to the ABS the Territory has the second highest gross household disposable income per capita, only the ACT beats it. The Territory’s job rate is at record highs, but not for Aboriginal peoples. The Territory is at twice the job rate creation of WA. Federal spending on the Territory is up by 15 per cent while in every other jurisdiction the average annual spend increase remains less than 3 per cent. Despite higher prices for goods and services in the Territory, the average Territorian has the financial capacity to cope easily except if you are Aboriginal. Therefore the Territory is growing richer, faster than anywhere else in the nation, but not for Aboriginal peoples, the majority who remain poor, and many of the poor, dirt-poor. Great description by Gerry of the great divide the NT. The problem for the Territory is that it’s population is too small to generate the income required to address the dreadful levels of poverty and inequality. It continues to rely on the Commonwealth for the short fall. Unfortunately the Territory Government syphones off funds to meet the wants of the white middle class in Darwin, and away from those in need. Rudd’s half baked tax plan just re-enforces the great divide.